← Sweetpea Journey #5: It’s a Bike! When I was in second grade, my career goal was to be an astronaut. One of my favorite movies was Space Camp. My library consisted of large books about the solar system. With the help of H.A. Rey, I knew most of my constellations. My dad and I built a model space shuttle which hung from my ceiling. 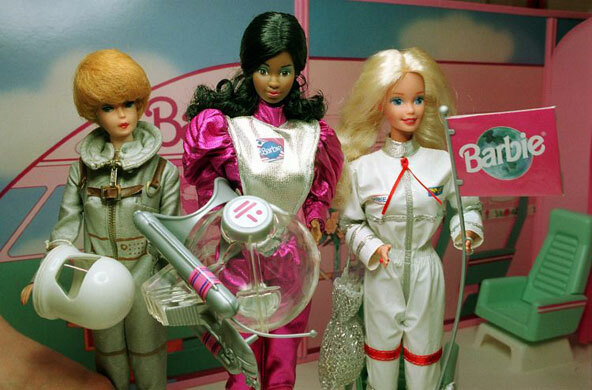 I had Astronaut Barbie! Even seeing a nice lady teacher get blown to smithereens a few weeks after my eighth birthday wasn’t enough to dissuade me. The following year, OMSI installed a one-room astronaut exhibit at their old location, centered around their acquisition of a modified aerotrim. Exhibit panels outlined the education and training one needed to go through to become an astronaut. Under physical requirements, it said women needed to be a minimum height of 5’4” to be accepted into the space program. With a grandmother that was 5’2” and a mother that was 5’3”, seeing that number is all it took. I told myself that it was possible I could grow to be taller than either of them, but I didn’t really believe it. My dream died that day. Suddenly it wasn’t as important for me to continue struggling through learning my multiplication tables. When I came up against a challenge in science, I was much more likely to be okay with rolling over and playing dead. When I visited OMSI the next time, seeing the same panel gave me the same strong sinking feeling in my stomach, but I bucked up and moved on to watch the dissection of a cow eyeball. The irony is, I am currently 5’4”.